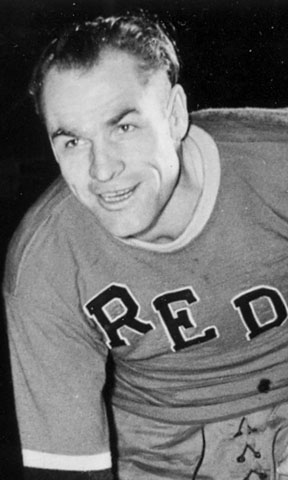 A “Class of 1964” inductee, Art Giroux was a member of four Reds championship teams: two Fontaine Cups (1931 and 1933) and two Calder Cups (1937 and 1939). Giroux had also won a Fontaine Cup with Boston in 1934 and a Teddy Oke Championship Trophy with the Detroit Olympics of the International Hockey League in 1935. In his nine seasons with Providence (1930-1934, 1937-1941 and 1943-1944), Giroux scored 255 points with 136 goals in 348 games.